In April 2014, Asus released a number of Android devices powered by the Intel Atom processor, including the Zenfone 5. At the time, the Zenfone 5 was interesting as it used a hyperthreaded Atom processor, so although this is a dual core CPU, Android sees this as a quad-core device. We recently covered the 4G version of the Zenfone 5, which replaced the Intel Atom processor for a Qualcomm Snapdragon 400 processor. The LTE Zenfone 5 also comes with 2 GB of RAM, 8 GB of storage plus a MicroSD card, but is otherwise very similar to the original model and has the same 5.0-inch 720p resolution screen and 8 MP camera. 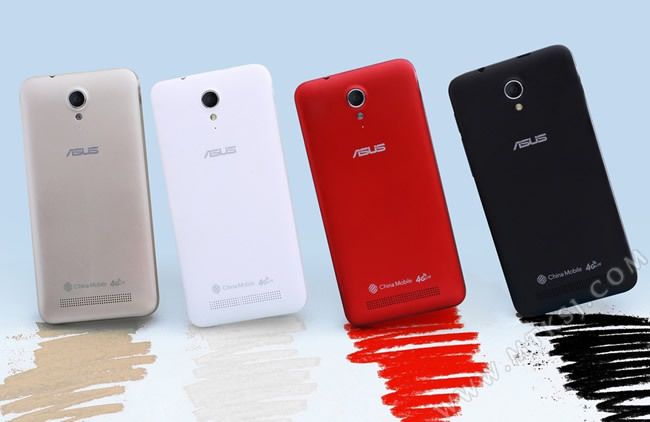 Asus have now revealed a new handset, the Zenfone T45, which will sit below the Zenfone 5 in the range. As is Asus' model naming standard, the T45 will have a 4.5-inch screen of 854 x 480 pixel resolution, a 1,750 mAh battery, a 5 MP rear camera with a 0.3 MP front camera and of course a 4G LTE modem. In the new model, Asus have switched away from Intel and Qualcomm and are using a LTE-compatible MediaTek MT6582 processor. This is a budget-orientated quad core processor that MediaTek advertise as "up to 1.3 GHz clock speed," although there's no word from Asus as to the speed of the T45's processor. The processor will be assisted by the Mali 400 GPU and 512 MB of RAM; this is an entry level handset. However, it'll come with Android 4.4 Kit Kat, which as we know has been optimized for low end hardware so performance should not be so bad. Asus are yet to confirm the price but we are expecting it to be cheaper than the $130 / £80 Zenfone 5 on account of its lesser specifications and smaller screen. It's important to note that the T45 looks similar to the more expensive cousins, which is important for fashion-conscious Chinese consumers. But one area that appears to be quite different is the software on the T45 because it looks much closer to stock Android rather than the Zen UI that the Zenfone 5 and 6 used. This may be symptomatic of the T45 having half the RAM of its bigger brother and to help the device remain smooth, Asus decided to keep things close to stock? It's also possible that Asus are not revealing the software of the device just yet and these images from MTKSJ show the prototype device.